Not Just Fruits, But Vegetable Juice Too! Everyone juices and you should too! Juicing can help to keep your veins and arteries healthy, so they can maintain the flow of blood and promote nutrient absorption throughout the body. Often the misconception surrounding juicing is that it’s all fruits that can be high in sugar, but vegetables are packed full of essential vitamins, nutrients, and antioxidants too that can keep your body running like a well-oiled machine. At Canada Vein Clinics, we recommend juicing to our patients that want to add something to their diet to keep their veins clear and functioning so that they can avoid the early arrival of varicose veins. This yummy and diverse leafy green is the leading shareholder of vitamin K. We need vitamin K to help maintain healthy capillaries and veins. The stronger our veins are, the better they will be under pressure from long days of sitting or standing, and the better they’ll work with supporting leg muscles to pump blood back to the heart. Beetroot is great in juices and contains a ton of vitamins A, B, and C that can lower cholesterol, boost metabolism and reduce stress levels naturally. Stress has a negative impact on the cardiovascular system, causing increased cardiac output that weakens the heart muscle and the competency of our venous system. Vitamin C works with the immune system to help keep inflammation low, and vitamin B works to maintain strength in blood vessels and veins. Consider adding beetroot to your juicing regimen to take advantage of all these healthy benefits! Apples carry high amounts of fibre, vitamin C, and polyphenols. Polyphenols are a form of antioxidant that are essential to maintaining healthy skin, hair, and the production of proteins and enzymes throughout the body. Antioxidants support the deactivation of free radicals produced by cellular respiration used during exercise to allow the muscles to contract and relax. To move blood upward against gravity, we need strong muscles to support the veins and help achieve healthy circulation. So maybe there’s a little truth to the saying, ‘an apple a day keeps the doctor away,’ after all. These water filled stalks can stalk us all they want, as they’re rich in sodium, potassium, and phthalides. Celery can supplement hydration in the tissues of the body and help supplement water molecules to dilute blood, thereby reducing the chance of clotting and deep vein thrombosis in the coming years. Celery lowers blood pressure by helping the vessels, veins and arteries relax. These juicy little fruits offer a nice store of anthocyanin, and depending on which colour and variety you choose, tannins can be present. Tannins support amino acid production needed to make healthy proteins as dictated by our genes. Over time, grapes lower blood pressure and assist in the antioxidant defense against free radicals. There was a reason why Bugs Bunny snacked on carrots all day long. These orange dynamos are another powerful antioxidant packed with potassium and vitamin B to lower the cardiovascular system’s affinity for cholesterol, and to lower blood pressure. We say it’s a win-win! An apple a day keeps the doctor away, but a glass of orange juice a day will impress your doctor. Not only are oranges loaded with a hefty amount of vitamin C, they offer a generous dose of phytochemicals which are known for their natural anti-inflammatory benefits throughout the body. Oranges are a great source of B-complex, which supports tissue regeneration, potassium, calcium and vitamin A. Can you imagine all of this goodness packed into a tiny fruit? We bet you didn’t know that about your morning OJ. Juicing these fruits and vegetables is often considered healthier than consuming the actual fruit itself. Of course, juicing and then quickly drinking fresh juice is best; juices that have been cold pressed and sitting for hours at a time aren’t the best option as the proteins, vitamins, and minerals break down the longer they sit. 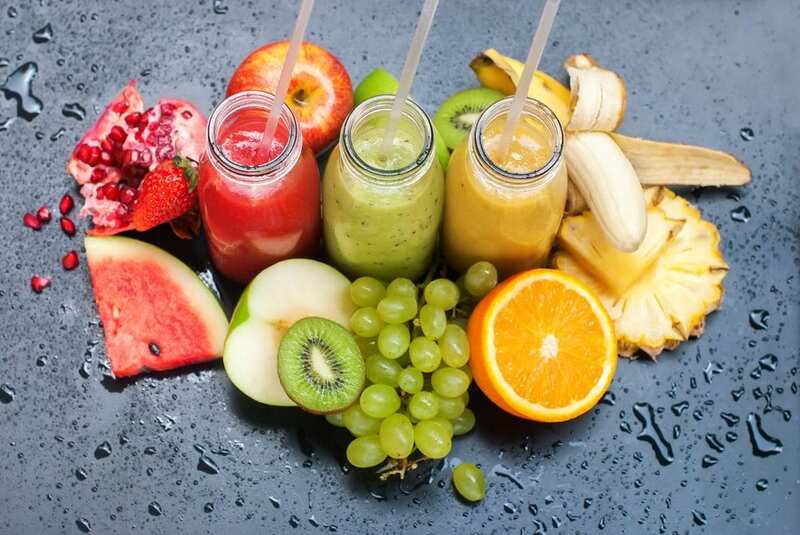 We recommend one six to eight-ounce glass of combined fruit and veggie juice per day to help maintain the proper metabolic processes within the body. These processes help lower blood pressure, and help contribute to healthy veins. Particular types of fruits and vegetables can lower the inflammatory response and boost the immune system to maintain a healthy cardiovascular system. When the heart is healthy, the veins are likely to be healthy too. Maintaining a balanced nutritional diet alongside regular exercise can lower your chances of developing varicose veins. If you’re experiencing pain associated with varicose veins, call Canada Vein Clinics to schedule a consultation for ClariVein, EVLT, VenaSeal and our other minimally-invasive treatment options at 1-888-876-8346.